Just THREE key goals for on-street parking management? Does this street (in Chiang Mai, Thailand) have a parking problem? It looks like it might. But thinking about street parking problems is difficult without thinking about GOALS. What do we want from each street? And what do we want from parking management in each street? 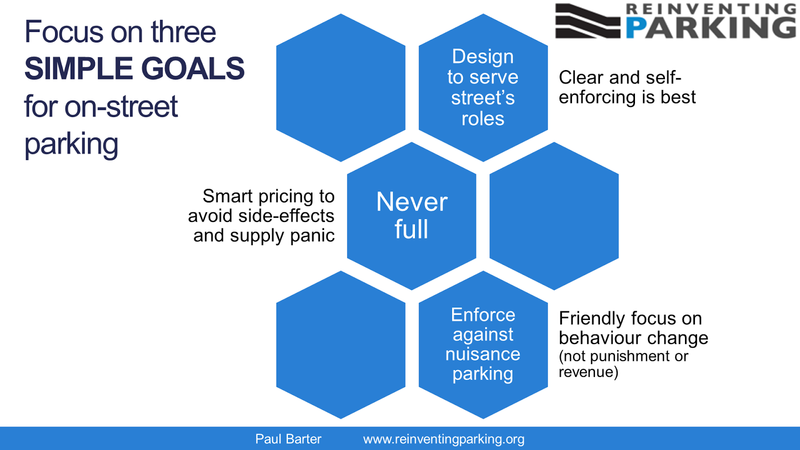 I think on-street parking management should focus on just THREE key goals. Only three? Are you skeptical? Read on! DESIGN WELL so that parking on each street section (if indeed any parking is appropriate) is located and organized in ways to serve the key purposes of that street (such as moving people, providing access to buildings and serving as a public place). So street design takes precedence over parking design. ENFORCE EFFECTIVELY to minimize parking acts that interfere with the important purposes of the street, especially parking acts that endanger anyone.The focus should be achieving good enough behavior. PREVENT FULL PARKING using management tools (often fees) to ensure that vehicles arriving can find vacant parking spaces on each street section (if parking is allowed). These goals complement each other. For example, good parking design eases enforcement by making doing the right thing as compelling as possible. Effective rationing also eases the enforcement burden by reducing the temptation to parking illegally. And certain approaches to rationing by pricing make enforcement especially efficient (such as pay-by-plate, which is easily integrated with digital enforcement). Conversely, effective enforcement is also essential to make sure good design and effective rationing work as intended. But what about all the other possible parking management goals? On-street parking management is important. In fact, I previously called it the "unglamorous but crucial key to success with parking policy". But is can seem complicated, which can make it daunting. So there is value in having just a few clear key goals. But are my three the right ones? Cities around the world DON'T typically focus on just the three above. Here is a list of OTHER possible parking management objectives. balancing parking against other competing uses of space, such as pedestrian space, transit priority lanes or bicycle paths/lanes. I am not saying ignore the others above. But they are not as central as the three key goals. Some fall within the big three. Some are useful but only in certain circumstances. Let's take a closer look at those other goals and why they are not key goals. What about turnover as a goal? Making turnover a goal is very common in on-street parking management. It typically aims to serve the needs of local retailers. But this goal (which aims to keep parking durations short) is really only important for the prime parking spaces in retail areas, where it enables a steady flow of arriving customers. Turnover is rarely relevant on residential streets or in a light industrial area. And even in retail areas, the real goal is to enable arriving customers to find a space. This is actually better served by making vacancies the goal. One of our key three! Turnover is a poor goal for other reasons too. What level of turnover is best? It is not clear. By contrast, there is good evidence on what level of vacancies we should aim for: the level that brings parking search time to zero (about 15 percent). Furthermore, even if good turnover is achieved there will be problems if parking demand is so high that each departing vehicle is almost instantly replaced. High turnover does not necessarily prevent full parking and its nasty side-effects. What about revenue as a goal? Revenue is a great side benefit of good parking management (both rationing and enforcement) but it is best not to see it as a key goal in itself. Revenue is not the real reason we enforce the parking rules. Revenue is not the reason we ration the use of parking spaces. Parking revenue becomes political poison when people suspect that revenue-raising is the main goal and that parking management is not really the priority. What about parking for people with disabilities? Obviously this is essential and I would include it as an inherent part of the Good Design goal. This is an important part of making parking design serve the purposes of each street. A key purpose of streets is providing access, which should be interpreted as access for all, with universal design wherever humanly possible. What about priority for special groups of people, like local residents? Actually it is absolutely vital to ENGAGE with key groups who might veto our parking policies. But even as we engage with groups, such as local residents, we should be very very clear about what we see as success in on-street parking management. Any negotiations over special arrangements to offer value and to ease objections should not lose sight of the actual on-the-ground results that we are aiming at. So, yes, engaging with key stakeholders (and maybe even compromising with them!) is part of any sensible approach to parking policy. But it is not a key goal of on-street parking management. An example. Residents sometimes demand exclusive access to the parking on their own residential street. This does not fit under any of the three key goals. But what if we press those residents on why they want residents-only parking or restrictions on parking by 'outsiders'? Keep asking why. I suspect that the key thing is the desire that parking be available close to home whenever they return. We cannot let people lay personal claim to specific spaces. But we can make vacancies one of our key goals and we can include in this the aim of ensuring vacancies for eligible residents as they return home. What about space for drop-offs/pick-ups, taxi ranks, loading/unloading or bus stops? These are certainly important too. One way to think of this is as part of the good design goal, especially for bus stops which certainly need dedicated curb space. But perhaps most of these would be best served by focusing on the vacancies goal rather than designing special designated space for these purposes? Rationing access to curb-space (parking) to achieve enough vacancies should usually be enough to ensure curb space is available for drop-offs and for loading purposes. Am I missing something? What about balancing parking against other competing uses, like bike lanes? Balancing parking space against other possible uses of that space, including walking space, transit priority lanes or bicycle paths/lanes is obviously central to the good design goal. It is all about serving the purposes of the street. What about higher-level goals like business success in the area or accessibility? I think this is covered by the good design goal. This should be in line with the agreed-upon goals of each street. And these street goals will have considered the goals of local stakeholders, like businesses. But once we have our on-street parking designed and marked out, then those spaces will be best used if we enforce the rules and if we ration their use to keep some vacancies ready for new arrivals. The three key goals offer useful guidance on important parking management choices in a huge variety of situations. Focusing on just these three goals points us in the right direction for more-or-less EVERY on-street parking management situation. All on-street parking needs at least some design effort to decide whether or where parking should be allowed and with what orientations. Even streets with little or no parking demand need at least a minimal design effort. All streets with more than insignificant parking demand need at least some enforcement against nuisance parking. Preventing overly full on-street parking and ensuring some vacancies is universally applicable too. If parking is well-designed and you have effective enforcement, then the source of any remaining serious parking problems will be the fullness of the parking. A persistent lack of parking vacancies commonly prompts illegal parking, double parking, waiting in traffic lanes for parking and slow cruising in search of parking. Neither design nor enforcement can stop these if the parking is often full. We can make the three key goals part of problem diagnosis for any location with an on-street parking 'problem' (like the street in the photographs at the top of this post). The Chiang Mai street at the top of this article has full parking for many hours every afternoon and evening. It also has some design problems which cause problems even when the parking is not full. And parking orientations are not following the current design, suggesting a lack effective enforcement. So problems framed in terms of all three key goals are relevant there. Can you think of an on-street parking problem that can't be framed in terms of the three key goals? I am sure I have not convinced everyone. In any discussion about categorizing things, people who are "lumpers" will come up with a simple and short set of categories, while the "splitters" will have longer and more complicated lists. You can probably tell that I tend to be a lumper. If you are a splitter, you might be frustrated by my simple list of three on-street parking management goals. Have I at least persuaded you that these three key goals should be at the top of any list of key on-street parking management goals? Let me know in the comments below or in the Parking Reform International group on Facebook or on Twitter. If this article was useful, please SUBSCRIBE to get an alert whenever there is a new post. This post by Paul Barter appeared first at Reinventing Parking. Three points are undoubtedly best to get the overall message fully registered. However I think an equally important part of parking control is to ration private vehicle travel demand to limit congestion, reduce pollution and improve the economy and environment of our towns cities and even countryside. Thanks very much for the comment, John. I agree that traffic limitation is an important potential goal of parking policy. In fact, limiting parking supply in certain areas is the D (for demand management) in my mnemonic, RESPOnD (see https://www.reinventingparking.org/2016/07/six-signposts-to-parking-revolution.html). And avoiding excessive parking supply (to prevent traffic generation effects, among other reasons) is a key goal of that agenda. But the focus of the post above was narrower: just on-street parking management. Some cities do reduce on-street parking spaces over time as PART of their wider parking supply reduction and traffic limitation policies (Copenhagen in the past and Zurich come to mind). I would include that under the Design goal in my three goals (parking design should be in line with street purposes and wider policies, including traffic limitation). But once we have decided how much on-street parking there should be in any set of streets, there is limited scope for using that parking for traffic limitation. It would seem odd to price so high that on-street parking spaces are mostly empty, for example. If you don't want parking, then remove the spaces. If you do want parking, manage it to achieve some vacancies. Does that address your thought adequately? Parking is no simple subject although it appears so, hence continuous update on reinventing parking is refreshing . we need to think of the impact on parking by driverless electric cars in various american and european cities. In India, we dont think that is ever possible.